Within a healthy set point the body has the correct ratio of lean body mass to fat. Staying within the set point parameters keeps the systems of the body working optimally. 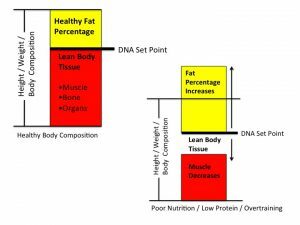 If the set point is altered due to dietary deficiencies, lifestyle, or system dysfunctions body composition is compromised. The Set Point is compromised when a person: doesn’t consume enough protein, overtrains, eats poorly, lacks the knowledge of muscle and fat metabolism. Muscle atrophy is detrimental to fat metabolism. Without muscle fat cannot be metabolized. Aging will promote muscle wasting unless the muscles are influenced by resistive forces, such as; weight training. Metabolizing body fat is accelerated when the muscle cells are activated. To maintain a healthy body composition all of the systems of the body must work synergistically through the right physiological parameters to fulfill the genetic coding. Spread the education. Please LIKE THIS PAGE and share it with friends and family. Thanks!